Looking to buy train horn kits? Strickland's has what you need to make sure everyone on the road can hear you loud and clear! Our train horns for trucks come quality made from the top manufacturers! 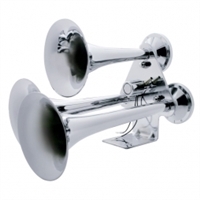 Choose from the classic style air powered horns (don’t forget the train horn compressor! ), or the electric horns, complete and easy to install! Strickland's is your number one source for train horns, and we carry cheap train horn kits as well! We carry chrome, powder blasted, and other finishes. Most train horns install easily anywhere on your truck or car with an L bracket. Simply mount it to a solid surface, preferably your chassis, and you are good to go.